In 2006 the Human Rights Institute announced a one semester Human Rights Institute Fellowship for tenure track faculty. The objective of this competition was to support and promote faculty research projects on human rights and to facilitate the writing of external grant proposals. The Fellowship was open to all tenure track faculty in all disciplines at Storrs and regional University of Connecticut campuses. 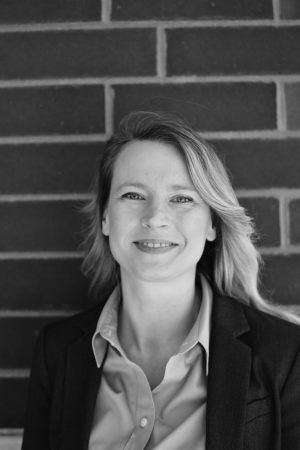 Bio: Caroline Kaeb holds a joint faculty appointment in Business Law and Human Rights at the University of Connecticut. Prior to this, she was a Visiting Assistant Professor at Northwestern University Pritkzer School of Law and was an affiliated faculty member at the Ford Motor Company Center for Global Citizenship, at the Kellogg School of Management (2013-2014). Her research focuses on the intersection between business and human rights and related aspects of corporate responsibility management, social impact, and regulatory mandates. She is particularly interested in how organizational psychology, human rights theory, and normative business ethics can inform the design of incentive compatible and impactful corporate compliance systems and corporate strategy formulation. Her work has been featured in numerous academic law journals as well as The University of Chicago Press. As a founding member and co-chair of the Working Group on Business and Human Rights with the U.N. Global Compact’s Principles for Responsible Management Education (PRME), Professor Kaeb is committed to integrating a normative human rights methodology into management education. Project Description: Professor Kaeb’s project under the Fellowship is titled “Twilight or Dawn? Mapping the Human Rights Mindset of Corporations” and it aims to empirically substantiate the relationship between corporate leadership (as manifested in corporate governance structures) and human rights. The goal is to empirically map the human rights mindset of corporations in order to better understand how corporations treat human rights concerns at the firm level, whether as a matter of law, morality, or good business. For this purpose, the project will conduct an empirical qualitative analysis through in-depth interviews of corporate officers and relevant internal and external constituents. The mindset literature from organizational psychology and marketing research provide the theoretical framework of analysis in order capture the corporate mindset about human rights in global business operations. The project fills a gap in the literature, which has provided normative treatment of implementing human rights at the firm level, but has not yet empirically substantiated these propositions. Normatively, the project would test a cynical presumption that has gained momentum in the human rights literature, namely that we are in an era of “twilight of human rights law.” [Eric Posner] An empirical study of business and human rights provides a compelling test case to deconstruct this narrative. Professor Holzer used the fellowship period to develop her research project on water, science and human rights in Ethiopia. During the fellowship period, she co-lead with Manos Anagnostou, Paul Block, Yang Hong, and Liangzhi You a grant proposal entitled “Taming Water in Ethiopia." The National Science Foundation awarded $4.3M to the proposal through the highly competitive Program for International Research Exchange competition in August. The project promotes a political-institutional model of science that links sociological and engineering methods in a people-centered, rights-based approach to the human-climate-agricultural nexus. In addition, she completed her book, The Concerned Women of Buduburam: Refugee Activists and Humanitarian Dilemmas (Cornell University Press, 2015), which came out in September. David's work is focused primarily on government respect for human rights. One of his primary interests is human rights measurement, and he is Co-Director of the CIRI Human Rights Data Project (www.humanrightsdata.org), which annually rates government respect for 15 internationally-recognized human rights in 195 countries. He also has an interest in the psychology of torture, and has a forthcoming article (with Mandy Morrill and Mary Anderson) in the Nordic Journal of Human Rights that examines the psychological roots of US Citizens' attitudes towards torture techniques. David's current projects-in-progress include two books: a human rights textbook for CQ Press, and a book (with Jillienne Haglund) on the strength and evolution of domestic legal guarantees relating to five forms of violence against women, worldwide, for Paradigm Publishers. It is the latter manuscript on which David worked on during his fellowship during the fall 2012 semester. During her Human Rights Institute Faculty Fellowship semester, Spring 2012, Professor Winter will be working on her book titled “The Novel, Habeas Corpus, and Human Rights”. Her project will delineate an important early phase in the recurrent conflict between the human rights of political prisoners and the sovereign prerogatives of nation states. The book uncovers a pivotal historical relationship between habeas corpus jurisprudence and the narrative representation of human rights, delineating the ways that a set of influential nineteenth-century English novels correlated the principles of universal human rights articulated in the United States Declaration of Independence (1776) and the French National Assembly’s Déclaration des Droits de l’Homme et du Citoyen (1789) with the widespread reputation in Britain of the “Great Writ of Habeas Corpus” as “the Palladium of Liberty.” She examined how the political prisoner came to embody the abstract bearer of human rights starting in the early decades following the French Revolution, a time when universal human equality was a rather new concept that provoked both utopian aspirations and political fears. Because political prisoners’ experiences were often not accessible to the public, imaginative literature played a key role in elevating the fates of dissidents into galvanizing political causes. “The Novel, Habeas Corpus, and Human Rights” will also refocus recent historiography on the emergence of human rights by exploring the ways that habeas corpus jurisprudence, during this formative period of political declarations of the “rights of man,” provided a working judicial procedure to extrapolate from the legal rights of subjects and citizens to universal human rights. Samuel Martínez is Associate Professor of Anthropology and Caribbean and Latin American Studies at the University of Connecticut Storrs. He is the author of two ethnographic monographs, Peripheral Migrants (1995, U Tennessee P) and Decency and Excess (2007, Paradigm Pub) and several peer-reviewed articles on the migration and labor and minority rights of Haitian nationals and people of Haitian ancestry in the Dominican Republic. A contributory volume that he edited, International Migration and Human Rights, has recently been published in simultaneous paper and free-of-charge Web editions by the University of California Press. During his Human Rights Faculty Fellowship semester (Spring 2011), he worked on preliminary stages of a project examining the texts and contexts of the stories that are being told about slavery today via the narrative portions of scholarly, journalistic, activist, and creative fictional texts, photo-essays and films. In response to an increasing demand for rigorous monitoring of States’ accountability in meeting their human rights obligations, a growing literature has emerged on measuring human rights fulfillment. However, the monitoring and promotion of human rights have emphasized political and civil rights; comparatively little attention has been focused on economic and social rights. Data are increasing used in human rights assessment and advocacy, but, especially with regard to economic social rights, ad hoc approaches dominate. Along with her collaborators, SakikoFukuda-Parr and Terra Lawson-Remer, Dr. Randolph has developed two alternative rigorous methodologies for monitoring State accountability in meeting economic and social rights obligations. The Human Rights fellowship will be used to write a book that fully documents the index and compares the alternative methodologies, investigates ways of integrating the principle of non-discrimination, and explores the policy implications of the index. The project ultimately seeks (a) a broad understanding of the sorts of policies and private initiatives that effectively foster the fulfillment of economic and social rights, (b) an understanding of the synergy between political, civil and economic and social rights, and (c) an understanding of the trade-offs and synergies between economic policies fostering income growth and economic efficiency versus those fostering economic and social rights provisions. To facilitate the realization of these broader goals, the fellowship will be used to apply for external grants to establish an Economic and Social Rights Accountability Program. Prof. Lahav’s current project concerns the role of the lawyer in perpetuating and resisting procedural injustice. The particular focus of her research is the role of lawyers in hearings before military commissions in Guantanamo Bay, Cuba. These military commissions constitute a type of legal black hole within an otherwise liberal democratic regime which claims to adhere to the basic principles of the rule of law. Because lawyers are officers of the court and the first defense of the rule of law, participation in this system raises serious moral questions. Is the lawyer that participates in these or other unjust hearings a seeker of justice or enabler of injustice? During her fellowship at the Human Rights Institute, Prof. Lahav conducted qualitative research in order to evaluate the justifications for and arguments against lawyer participation in unfair hearings. She explored the following questions from lawyers involved in the military commission process: How do lawyers justify their participation? Are they concerned about complicity in the system? What factors should lawyers consider before choosing to participate in a system they think is unfair? Is there a principled stance that lawyers ought to take (such as that boycotts are categorically wrong because they leave potential clients without access to a lawyer)? Or should lawyer decisions to participate or refrain be contextual and pragmatic? During her fellowship with the Human Rights Institute, Professor Hertel developed a project on economic rights implementation – focusing, in particular, on public attitudes regarding ethical consumption. Are consumers willing to purchase goods and services created in a socially and environmentally responsible manner and if so, why? Is willingness to pay for “fair trade” coffee or “sweatshop free” clothing, for example, tied to popular conceptions of human rights or to related social movement activism? In November 2006, Hertel and colleagues at UConn carried out a pilot national public opinion survey (through the Center for Survey Research and Analysis) that revealed significant public awareness of the right to a minimum guaranteed standard of living as a human right – and even higher willingness to pay for ethically produced goods among that segment of the population. Nevertheless, much remains to be learned about why consumers do or do not prefer this type of products; how businesses vary in their response to such demands; and whether or not ethical consumption positively affects the implementation of economic rights or actually has negligible and/or unintended negative consequences for social welfare outcomes. Hertel used her semester a Human Rights Institute Fellow to design and raise funds for a more in-depth national survey and an experimental component to advance this research agenda. "A number of late 20th- early 21st century political and intellectual movements put a spotlight on the value of listening to silenced voices. In consciousness raising sessions, second wave feminists exchanged stories of their everyday lives and used these stories to construct theories of gender and to formulate political agendas. Soon women of color and lesbians in western as well as developing nations objected that middleclass white feminists had silenced them and consequently misrepresented womanhood and the needs of women as a group. Critical race theorists made the case that injecting personal stories of racial oppression into U.S. legal proceedings is indispensable to the eradication of white supremacy. Recent truth commissions in South Africa and Peru and war crimes tribunals in the Hague and Rwanda have reaffirmed the right to a voice of one's own. Picking up on these trends, philosophers have addressed a number of pertinent themes: respect, empathy, and credibility. Less thoroughly explored is the relation between victims' stories and normativity. My work explores how the stories of those who have been abused or oppressed can advance moral understanding, catalyze moral innovation, and guide social change. More specifically, I focus on narrative as a variegated form of representation, analyze the diverse forms that personal narratives of victimization take, and theorize the distinctive ways in which each type of story connects with human rights discourse.